We’d been in the badly-lit cart barn for over an hour, as the storm came ashore from the Gulf of Mexico, when my fellow caddie Pistol discovered the scorecard that had been resting on the steering wheel of the cart he was in. 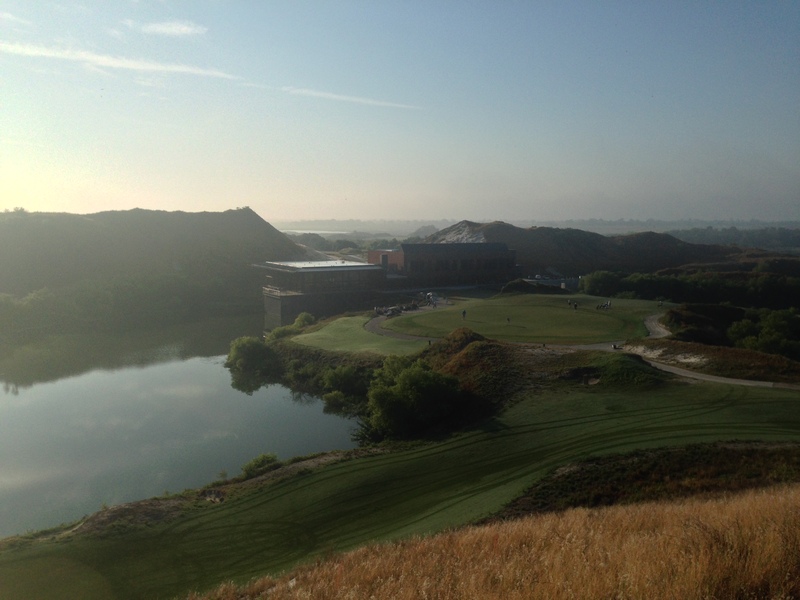 The card recorded the events of the first two holes played by a foursome on Streamsong’s Red course, and told a tale of much woe: the foursome had played the first hole in an eye-gouging fourteen over par. Five of those over-par strokes came from one poor wretch’s nine. “The fact,” Pistol laconically observed, “that the guy wrote down the nine means it probably wasn’t his first this month.” Still, he’d written down the nine, for some mysterious reason—but why? Something I had read recently suggested not only existential despair, but also that the answer might have to do with slot machines and Australian beards. According to a recent study of styles of men’s facial hair—as revealed by newspaper photographs going back more than a century by two researchers from the University of New South Wales—there is no one “right”method of wearing facial hair. Instead, what’s fashionable in beard styles is simply something they call “negative frequency dependence,” which just means that whatever the desirable style of the day is will simply be determined by what’s rare, not because of something internal to the style itself. “Patterns of facial hair enjoy greater attractiveness when rare than when they’re common,” the researchers found. Which, I’d grant you, hardly seems earthshaking, nor does it appear to have much to do with golf. Bear with me though, as we try to answer the question of why anyone would habitually write down their nines. “True” golfers, of course, will harumph at the question itself. “Golf is like solitaire,” Tony Lema once said: “When you cheat, you only cheat yourself.” Yet given the scores of the other players in the foursome, nines were not unfamiliar to the group—in that case, however, why continue to play? Why not either improve or … just cease to keep score? Continuing, year after year, decade after decade, to play golf poorly seems like one of those mysteries of the human race that alien archeologists will one day wonder over. As Bill Pennington of the New York Times reported in 2005, the “average 18-hole score for the average golfer remains at about 100, as it has for decades, according to the National Golf Foundation.” This, despite the millions spent on game improvement technology like titanium woods and over-engineered golf balls; technology often researched by (former) rocket scientists who’ve left the NASA or the defense industry in order to find an extra four yards from your seven-iron. Yet, despite the money spent, the fact that this quest has largely been fruitless is just accepted: “Maybe we’re all supposed to stink at this,” says the revered commentator David Feherty in Pennington’s story. Yet Feherty’s line explains nothing, just as—the American philosopher Richard Rorty liked to point out—the doctor in the Moliere play’s claim that opium put people to sleep because it had a “dormitive power” explained nothing. Recently however I came across an article that just might explain something about this gap between the billions spent and the apparent lack of result: a piece by one Professor Ian Bogost, of Georgia Tech, in The Baffler about a seemingly unrelated subject—the rise of “social media” games like FarmVille or Candy Crush. What Bogost suggests is that such games have a lot to do with that perennial stalwart of the Las Vegas economy: slot machines. Citing the work of psychologists Geoffrey and Elizabeth Loftus, Bogost tells us that slot machines exploit “a type of operant conditioning that provides a reward intermittently,” or “partial reinforcement.” In other words, precisely the mechanism that B.F. Skinner explored in his behaviorist experiments with rats: so long as, once in what can be a very great while, a reward gets doled out, there’s virtually no end to which mammals will not go. As the subject of the recent short film, Lapse: Confessions of a Slot Machine Junkie, says about his time in front of the machines, slot machine zombies that sit in front of their spinning fruit in the casinos that have sprung up across America in recent decades are “Irrational, stupid, like a little rat in a wheel.” But slot machine junkies continue on with their behavior even though many of them realize how absurd their behavior is. What that would seem to say is that the man taking a nine—and not thinking it extraordinary—is playing golf for the few moments of pleasure the game affords him, and ignoring the rest: remembering the fifty-foot putt that dropped, and not the seven shots that preceded it. Or the solid nine-iron from the fairway that somehow stopped next to the cup—and not the sliced drive into the woods, followed by the three chip shots that restored him to the fairway, that led to the moment. It would be a species of what’s often called “selective memory,” which is something that we all think we are familiar with on a conversational level these days. But the more sobering idea to arise from Bogust’s piece isn’t that people ignore evidence that doesn’t suit them—but that golf exists, not in spite of, but because of the intermittent rewards it spits out. What the idea of “partial reinforcement” suggests is that—seemingly paradoxically—if the casinos rejiggered the slots to pay out more often, that would lead to less play rather than more. The slot machine zombies aren’t there for the payoff, but—it could be said—for the long stretches between payoffs. In the same way, it may be that the golfer isn’t there for the brilliant shots, but for the series of shots between the fantastic ones: if golfers were better, in other words, the game would not have as much appeal. Just as the slot machine player, deep down, doesn’t want to win—or rather, wants to win just enough times to maintain the illusion that he’s playing to win—so the golfer doesn’t want to get better. In that sense, then, what all the money spent on researching the latest hot ball or driver is being spent on is creating that illusion for the golfer: the illusion that he really does want to get better—when in fact he does not. It’s about here—in the midst of a rather dark picture not merely of golf, but human beings generally—where the beards come back in. What the foregoing suggests, after all, is that the reason people continue to play golf badly is precisely because of the rarity of good shots—just as people, according to the Australians, are attracted to certain beard styles because of their rarity, not because of anything intrinsic to the styles themselves. The appeal of the idea, at least when it comes to golf, is that it explains just why people would rather spend money on expensive golf clubs, rather than something that would actually improve their games in a lasting way: namely, lessons from a certified professional golfer. So long, in other words, as a person is able to hit the occasional good shot—which, strictly in terms of chance, he or she is bound to do once in a while—it does not particularly matter that all the rest of the time he or she is hitting terrible ones. Purchasing expensive equipment then could be thought of in two different ways: the first is that it’s the same kind of shortcut as, say, taking speed can temporarily help with weight loss. Just as practice is the only real way to get better, so is diet and exercise the only real way to improve your body. But just as a “magic” pill can cause a temporary weight loss without effort (even if it’s all gained back later), so can a new driver or irons cause a minor improvement from your older clubs. Since getting a new club requires only money, whereas lessons and practice requires time, it’s easy to see why people would go for that kind of fix. Yet, that’s not the only possible interpretation here: there’s a darker one suggested by the investigation into beards. Remember, no kind of beard is intrinsically better than any other kind—which is to say, there’s no way to investigate beards rationally and discover a single “best” kind. If golf is more like that, rather than the kind of thing that can be worked at, then buying a new golf club is, in this scenario, not so much a means of improvement (even if it’s known to be the same kind of shortcut as, say, taking speed can temporarily help with weight loss) but instead a kind of offering to the gods of rationality itself. That is, buying a golf club is like burning a goat (or, say, your daughter if you have a pressing need to get to Troy and the winds are not cooperating): it’s a way to simultaneously a recognition that golf is largely a matter of change (at least in your own case) and also an attempt to influence that hand of fate. What is disturbing about this, to be sure, is the whiff of primitivism about it—the suggestion that the Enlightenment is merely a passing moment in the history of humanity, and that the return of the Dark is merely just beneath the surface, or a turn around the corner. “Grow a beard?” said a voice somewhere in the echoing darkness. The course closed for the day shortly thereafter. I was standing with a rake in my hand while Chip Beck, the former Ryder Cupper, was giving a sand lesson to Butler’s head pro in the bunker on the par-three eighth. The basic problem, Chip said, was that the club pro wasn’t zipping his right hand under the ball, which wasn’t then spinning enough. It’s the sort of “secret” information amateurs are always asking me about, which is not unreasonable of them. Amateurs can see the vast difference between their game and the pro game, and they intuit that that difference must be due to some dark gnosticism. Which is true, in a way: there are things about golf that you won’t know unless you’ve spent some serious time practicing and studying. Yet that isn’t occult knowledge—it isn’t due to some inborn birthright, it’s just a matter of spending the time. And that isn’t the same thing. It’s a point that was brought home to me by looping a golf course that in many ways is directly opposed to Butler National: Chicago Golf Club, in Wheaton, Illinois. Chicago Golf Club is one of the five founding clubs of the United States Golf Association and the first club in America to have eighteen holes. It’s notoriously hard to get on to; routinely, people attempting to play the 100 top golf courses in America or the world report getting stuck on Chicago Golf, which might be the least accessible course in the world. Chicago Golf Club is, in other words, as traditional a golf course as exists anywhere. Its first members were stalwarts of the old WASP aristocracy—one of the club’s first presidents was, it seems, Robert Todd Lincoln, Abraham Lincoln’s only surviving son. It is so traditional, indeed, that since—aside from St. Andrews and a very few other courses—it’s one of the oldest golf courses in the world, it might be said that there’s none more traditional. One of the ways Chicago Golf expresses its traditionalism is by outright banning the use of laser rangefinders and other kinds of technology on their golf course. It’s a policy that’s directly opposed to the policy at Butler National, where every caddie is not only allowed, but required, to have a laser rangefinder so that exact distances can be computed. Not only to the pin, in fact, but to any other obstacles that might require measuring. The distance between the two policies became stark to me during a round at Chicago Golf where I had a guest who was a Butler member. He asked me early on how I knew where the pin was? I said: I don’t. This nearly broke the poor man’s head, it was so alien to him. But as I explained to him, since very seldom at Chicago Golf does the location of the pin even matter, not knowing the actual yardage is, in a way, to the golfer’s advantage. What that uncertainty does is get the golfer out of the mindless rote of this yardage equals this club, which is not only very dangerous but also kind of defeats the purpose of golf itself. Part of the game, at least as played at Chicago, is the intellectual satisfaction of solving the puzzle, not simply the purely physical act of hitting a good shot. Without that, the sachems of Chicago decree, there’s very little point to the game at all—without it, golf is merely a very long range game of HORSE. From the perspective of Chicago Golf, then, what’s done at Butler isn’t really even golf; it’s merely a kind of calisthenic done in a pasture. But while that’s perhaps a seductive image of golf, there’s another possible view. From the perspective of Butler National, it’s possible to say, what’s done at Chicago Golf is a kind of primitive, perhaps animistic, worship of a dead or dying god. The difference between Butler and Chicago, in other words, maps rather neatly onto another divide in sports these days. “It’s a battle,” writes Sean McIndoe of the ESPN website Grantland recently, “sports fans have come to know well over the years.” And that’s the conflict between the “analytical” types with their “new stats and theories,” and the “old-school thinkers” who “question how much can be learned from a spreadsheet.” It’s a war, if it can even be called that, that’s been fought out in golf for decades: ever since somebody decided that maybe it might be a good idea to put a bush at the hundred yard marker, golfers have become ever more analytical. Luke Donald’s rise to Number One in the world golf rankings is similar: Pat Goss, the coach at Northwestern University where Donald was educated, was “an early adopter of the new analytics,” and studying Donald’s numbers he found that while the Englishman was a good ballstriker, he wasn’t much of a wedge player. Donald took that insight, practiced his wedge play, and as a result climbed the rankings until there wasn’t any further to go. All of this statistical analysis, of course, might be irritating to the shamen of Chicago Golf, who might say that this sort of deep number crunching is antithetical to the sport. “The statistics,” says Goss, “take the emotions out of it.” But what’s left of the sport if the emotions are taken out? we could imagine a Chicago Golf member asking. What’s the point of playing at all in that case? The easy way out, to be sure, is just to say that both ideas of the game can co-exist: one, say, for professionals, and one for amateurs. Such a view might comport with our age—an age that has returned, in many ways, to an outlook that might have been familiar to Robert Todd Lincoln. Witness for instance the great reverence for Doris Kearns Goodwin’s book, Team of Rivals and the Stephen Spielberg movie based on it, Lincoln. The political commenter Thomas Frank noted recently how, around the time of Barack Obama’s election to the presidency in 2008, the political class in Washington was fairly bursting with praise for Team of Rivals, praise that likely reveals more about today’s Washington than Lincoln’s. Goodwin’s book is about how—gasp!—Lincoln assembled a cabinet of advisors (a team) who were—double gasp!—once his political competitors (rivals!). Despite being demonstrably true of virtually every leader in virtually every field ever—what leader hasn’t had to preside over people who, had things gone differently, might have been giving him orders?—Frank noticed that, to “a modern-day Washington grandee,” the idea that the electorally-defeated could still hang around held the promise of “an election with virtually no consequences.” “No one,” that is, “is sentenced to political exile because he or she was on the wrong side: the presidency changes hands, but all the players still get a seat at the table.” Every kid’s a winner. In a way, it’s a lovely idea: nobody has to be wrong in such a world. It’s just that, as Frank points out, the film not only praises the notion of Compromise but takes it a step further: Lincoln, the film, “justifies corruption.” In fact: Spielberg & Co. “have gone out of their way to vindicate political corruption.” Oh, you want to ban slavery? the film says. Maybe you won’t mind a few payoffs then. More worrisome, however, is that underlying that message is the suggestion that there’s even anything to be right about—after all, even Thaddeus Stevens was only motivated not by hatred for an institution that denied to humanity to millions, but because he lived with a black woman. Or, to put it another way, “there is no such thing as ‘common observation’ or simply reporting the facts,” because just what constitutes facts is what is at issue. In that sense, “simple reporting is never simple and common observation is an achievement of history and tradition, not the result of just having eyes.” Which is just to say that, since it cannot be that one person might see things more clearly than another—both being formed not by the perspicacity of observational powers, but rather by a particular upbringing within a particular community—hence it is better to proceed by “consensus,” rather than deciding that one person is right and the other wrong. Naturally, that sounds like a reasonable method to proceed by—certainly, one might think that it resulted in the fewest hurt feelings. Yet, someone with a long memory might notice that such procedures may violate what the ancients called the “laws of thought”; namely what’s known as the law of non-contradiction. There are, the ancients said, three laws of thought—or at least, one law and two corollaries. The first of these is the law of identity; anyone who says “it is what it is” is quoting this law. It means a thing is that and not something else. The law of non-contradiction is, arguably, a special case of that law; the best statement of it is by the Arab, Avicenna. “Anyone who denies the law of non-contradiction,” wrote the Arab philosopher Avicenna, “should be beaten and burned until he admits that to be beaten is not the same as not to be beaten, and to be burned is not the same as not to be burned.” It’s perhaps an extreme way to make the point, but it’s a pretty arresting image. What it means is that either one statement, or its opposite, is true—but not both. Either the correct way to golf is that practiced by Chicago Golf, or by Butler National. Which is it? Well, what one might notice about Fish’s theory is that it says that, in order to judge a thing, you have to already be enmeshed into it, already know the code words and the deep meanings—the “secret,” hermeneutical, gnostic knowledge of insiders. It says, in other words, that the true meaning of golf is that envisioned by Chicago Golf. The view from Butler National, however, that holds that choosing the right club is based on an accurate reading of the actual yardage, not a deep familiarity with the particular course and the particular weather of a certain day. Just so, it’s the sabermetricians who say that anyone equipped with the right stats, not decades of watching minor leaguers, can select the major league ballplayers of tomorrow. It isn’t necessary to have the kind of “deep” knowledge that places like Chicago Golf (or the old baseball scouts of “Moneyball”) implicitly argue is required—a position that, one might think, is obviously on the side of what used to be called “the people” against the interests of the powerful. And yet, through some kind of alchemy, it’s people like Fish who are widely acclaimed to be “leftists” these days. In reality, however, there’s not a lot of need for “secret” knowledge to understand events. In the case of the government shutdown, for example, the math shows that it is about 18% of the population (as represented in Congress) that is attempting to thwart the will of the other four-fifths. Which is to say that if the Left wants to tackle a project that might actually matter to the masses, it might do better to teach how to count, rather than how to read. “Secret knowledge,” that is, is something most people can’t afford—nor do they have, in reality, any need for it.